I'm a chocolate dessert kind of girl. If it's not chocolate, preferably dark chocolate, I usually can't be bothered. There are a few exceptions to this rule. One of those exceptions is an apple tarte tatin so when I was flipping through the latest issue of Cooking Light, enjoying all the fall flavors that are on their way, and I happened upon a recipe for tarte tatin, I knew I had to make it. The boyfriend has deemed this recipe a certain keeper and the smell that it filled my kitchen with as the sugar caramelized at the bottom of my cast iron pan is divine. Place flour, sugar and salt for the crust in a food processor and pulse to combine. Cut 6 T butter into small pieces and add to the flour. Pulse until mixture becomes crumbly. Add ice water and pulse until clumps start to form. Dump out the contents of the food processor onto a piece of saran wrap, form a disc and refrigerate for 30 minutes. Mix the apples with the lemon juice and 1/4 t salt and set aside. Melt 2 T butter in a 9 1/2" cast-iron pan and add 3/4 cup sugar. 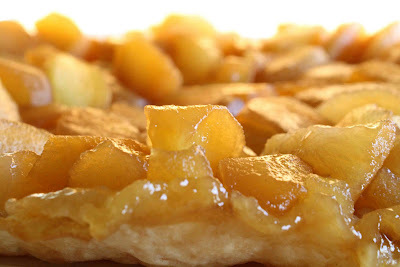 Melt, stirring constantly, until the sugar and butter become liquid and start to caramelize. 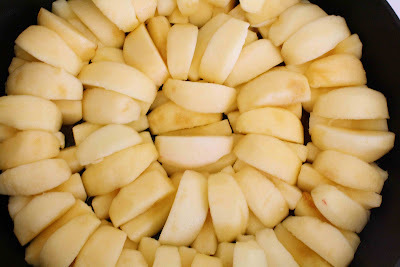 Remove the pan from heat and arrange half of the apple slices in a circle with the rounded side down. Cover with the remaining apple slices with their rounded sides up (as shown below). Return the pan to medium heat and cook for 15 minutes. Again, remove from the heat and let stand for 15 minutes while you preheat the oven to 400* and roll out the pie dough to a 10 - 11" circle. Cover the apple mixture with the dough, tucking the overhang down under the apples. Cut a few vents for steam and bake for 45 minutes. Let stand for a few minutes before inverting on a plate to serve, apple side up and enjoy! What a wonderful Fall dessert! The pictures are beautiful and make me want some warm apples. Your apple dessert looks so beautiful and so wonderful for fall. A dessert that definitely makes you feel warm and cozy! Hopie - you're right, it's not difficult at all. The most time consuming part is prepping the apples, but it's definitely worth it! Meg and Kathering - as much as I have to see summer go, I can totally comfort my warm-weather yearnings with great fall food like this. What are your favorite fall foods? Apples are in season and I am loving them! Your dessert looks amazing! Oh MY!! That looks absolutely divine! I just visited the apple orchard over the weekend and have an overabundance of apples (we couldn't stop picking! ), so I will definitely be trying this. Thanks for stopping by my blog today! I saw that recipe too and have bookmarked it to try! Yours looks fantastic! Thanks for welcoming me to the blog roll! This looks delicious. I'm going apple picking next weekend and hopefully whatever I end up making will end up as pretty as yours! This looks great! I'm going to have to try this. That looks wonderful! Beautiful dessert - I prefer chocolate too, but I'd definitely be hard pressed to keep from devouring this one!